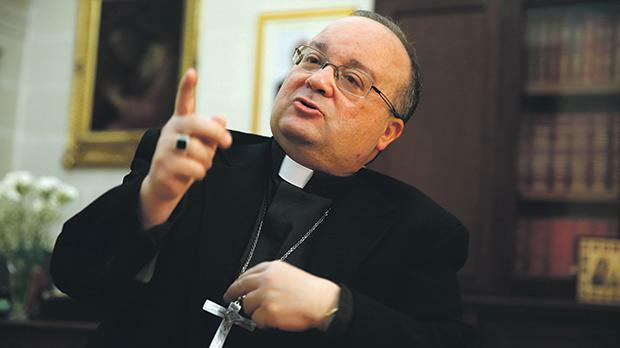 On February 27, 2015, Charles Scicluna was named head of the Maltese Church. One year on, the outspoken Archbishop speaks to Kurt Sansone about change and the lessons learnt. It has been a year since Pope Francis announced your appointment. How has your life changed? I was already a bishop and working in the Maltese Church as Apostolic Administrator, but this changed because now I can’t pass the buck to anyone else in the diocese. I have realised that to be at peace with my mission, I have to consult those around me and this has been an important lesson. I was working in a team for 17 years in the Holy See and as an Archbishop I realised I also needed to work as a team. Have you found your own style of leadership? It is a highly collegial style. I like to discuss things before I take a decision, but when I decide I move ahead to implement things. However, I have also learnt to review decisions I feel are not effective. I feel free to revise a decision and this gives me great peace of mind. Have there been any decisions you reversed? I remember a moment when I accepted the resignation of a parish priest because he insisted he could not go on. When I started asking people in the parish about the profile of a new parish priest, I realised they wanted the former one. The parish priest came back telling me he was sorry to have resigned and I told him not to worry. I withdrew my decision and he continued in his role. Have you changed the structures and people in the Curia? Yes. The Vicar General, who implements the Archbishop’s decisions on a pastoral level, is a new person, Fr Joe Galea Curmi. He is a man of great integrity, intelligence, discretion and also has a good sense of humour. It also helps to have people with good humour around me. But I also introduced two Episcopal Vicars, Fr Rene Camilleri and Mgr Charles Cordina. Episcopal Vicars are rare things in the recent history of the diocese. Fr Camilleri is responsible for evangelisation. It is his role to translate what Pope Francis said in his apostolic exhortation Evangelii Gaudium (The Joy of the Gospel) into action. Mgr Cordina is responsible for the Church’s charitable work. Service without the word is hollow and becomes philanthropy. Word without works of mercy is also hollow. But my team includes lay people, who bring a number of skills on board, as is the case in financial administration, media and safeguarding against abuse. Have you managed to draw back people to Church? I get different feedback. Some tell me there is a new atmosphere in the diocese but I do not think it is only about the bishop. It is also the Pope Francis effect. People like a Church that has a role in society but also like a Church that accepts it is a voice among many others. I am comfortable with this because Malta has become a pluralistic society. If I want to be a stakeholder in this environment I have to have a voice without pretending I am going to have the last word. Using your voice has been a characteristic of your leadership. Some welcomed this. Others argued the Church overstepped its remit. Do you feel there were occasions when what you said went beyond that limit? I need to find a balance. I am discovering, very quickly, certain raw nerves in Maltese society. We need to learn how to accept criticism when it is addressed to the government of the day. Unfortunately, most of the time it is interpreted as an attack on a political party. We have to mature in the conviction that if we want to promote a truly democratic environment, we have to be able to discuss things with respect and not take matters personally. I am on the receiving end of very strong reactions, and I also have to learn not to take things personally. When people react very strongly to what I say – they may express anger or frustration – and I have to accept that. In a democratic environment, the only thing I would not accept is silence. Pope Francis has this incredible image of a bruised and wounded Church in the marketplace. I would prefer such a Church to one that is sitting pretty in the sacristy, taking care of the only sheep that decided not to leave the fold. You have been described as Nationalist-leaning because your public criticisms have always hit out at one side of the political fence. How do you respond to this? So if I am talking about safeguarding the environment, it is because I am convinced that on an island like this we need to ask ourselves whether we can afford to build everywhere. We have to leave green areas and beautiful landscapes for our future generations but also for our quality of life. If people feel that by criticising a development on the whole of Żonqor is Nationalist-leaning, then that is unfair. Labour is in charge and they have to take responsibility for their actions and accept that any critical comment is made in good faith. Do you have any regrets from the past year? I have been to hospitals and schools on various occasions but I have not yet managed to structure these visits and make them more frequent. On a Friday the bishop has to be where suffering is and I have not managed to do that. What were the significant moments this past year? On a personal level it was not only becoming an Archbishop, but also the death of my father during the Pallium pilgrimage with my family in Rome. On a Church level, it was Pope Francis’s encyclical on the environment (Laudato Si’), which provided encouragement for the Maltese Church’s policy to promote stewardship of the environment. But Pope Francis also gave us an important motive to work on when he declared the Year of Mercy. It is a message of compassion and inclusivity. On a national level, a significant moment was the high profile visit of the Grandmaster of the Knights of Malta – a religious order – and the commemoration of the 450th anniversary of the Great Siege. It was an excellent idea by the government to commemorate the Great Siege as an interfaith celebration. The things we did with the Imam sent out an important message. 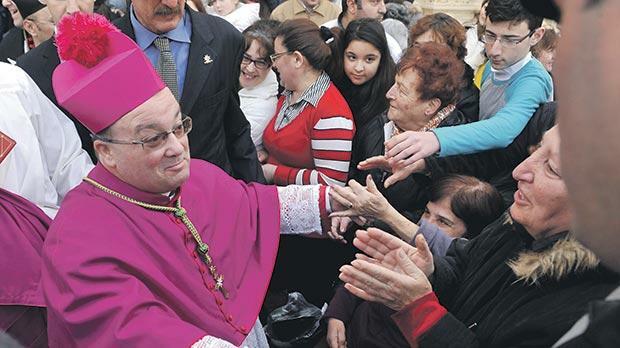 The Maltese Church was bruised by allegations of child abuse. Do you think this wound has healed? No, because there are open wounds out there. It is very difficult to respond to wounds when you represent an institution that has caused them. What I promise my people is that we take safeguarding [against abuse] very seriously. Andrew Azzopardi [the head of the Church’s Safeguarding Commission] is doing extraordinary work in this field. I cannot promise there will be no abuse because unfortunately it happens. But what I ask of my people is for disclosure. They should not be afraid to talk about what happens, whoever the abuser is. We have to create an environment where people are safe and empowered to speak. There are wounds that need healing. There are still victims in court seeking compensation. The more important thing is for the courts to decide as soon as possible. Victims are entitled to compensation. The problem is who is going to pay. The principle I have always promoted is that the perpetrator should pay for what he did, not only on the criminal side but also civilly. There have been long-standing complaints over the length of time it takes to get an annulment from the Ecclesiastical Tribunal. What have you done to address this? The most important thing that has happened was not done by me but by Pope Francis. After almost 300 years, he decided that you only need one decision to have a Church annulment. Since 1741 you needed two decisions that conformed. So, if you got a negative decision from the tribunal at first instance, and then a positive, you still needed another decision that was positive to have the annulment confirmed. The Pope’s decision means that if the tribunal decides on first instance, the marriage is null and both parties can remarry – except in cases where either of the parties may have an impediment – without having to wait for a confirmation. Has the tribunal put this policy into practise? The new law was announced on September 8 and came into force on December 8. All cases that had received a positive decision in first instance were confirmed on December 8 by the second instance and these people could remarry. There are some cases still pending in the Appeals Tribunal and unfortunately people have had to wait to get an answer. With this new law, the Appeals Tribunal can now concentrate on the very difficult cases where the couple would have appealed from a negative decision. Both (Gozo) Bishop Mario Grech and I are very keen to offer whatever assistance we can give. There has been a special procedure introduced by Pope Francis – another historical development – for those cases where the two parties agree and where the nullity is very clear. The tribunal can process them and refer the case to the Archbishop for a decision. Three cases have been handled with this special procedure and the first case was forwarded to me this [last] week. A decision will be taken in the coming weeks. I need to pray, and I find prayer is an essential part of my life. If you were to ask me whether I pray enough, I’d say I need to pray more.